Perhaps the most obvious impact of kangaroos, to the casual observer on the Reserve, is the creation of large bare areas where they camp, usually under trees. Bare soil, however it is caused, is at risk of being eroded in heavy rain. 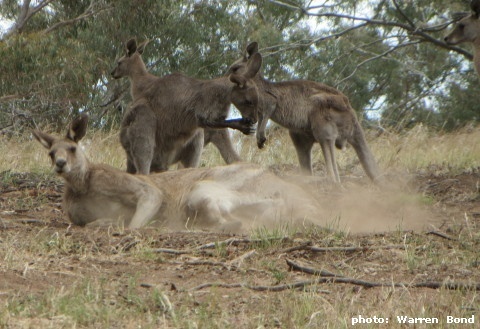 As well as denuding their camp areas of vegetation, the kangaroos also loosen the soil by scratching, making it even more prone to being washed away. 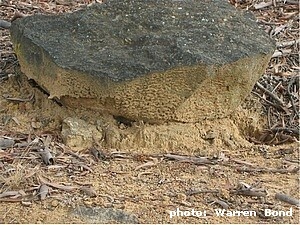 Many examples can be found where a kangaroo-produced bare patch has led to erosion of the topsoil, and the even more fragile underlying subsoil. 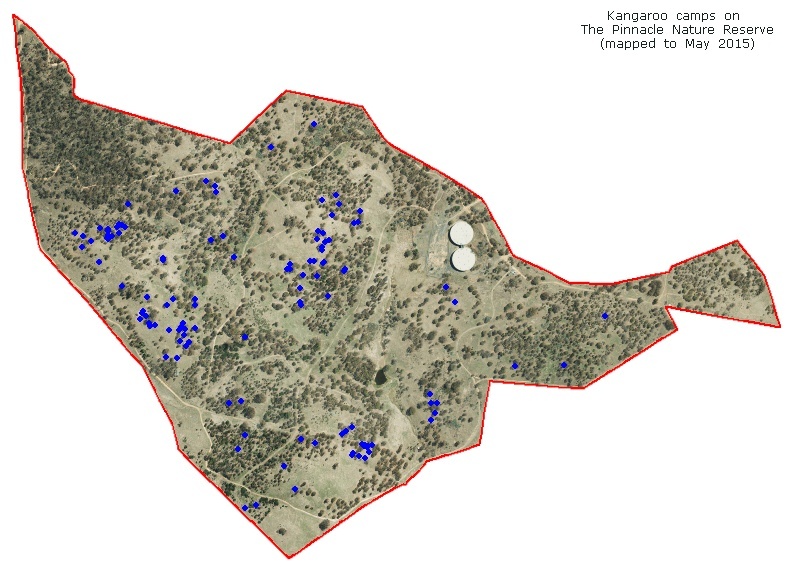 Partial mapping of these kangaroo camps has been carried out, showing that they are quite numerous and widespread. 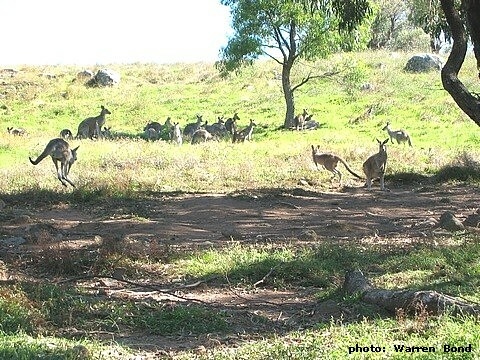 We can reasonably assume that the number and size of these disturbed areas increases as the kangaroo density increases, and that with kangaroo densities closer to the conservation density the level of disturbance would have a less significant overall impact on vegetation cover and soil loss on the Reserve. 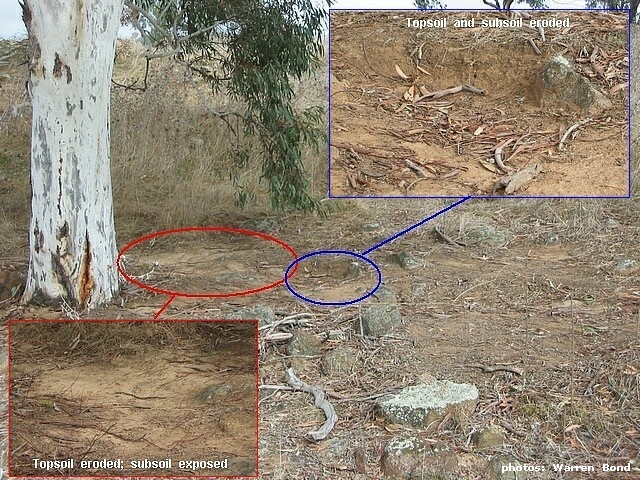 The photographs below show examples of recently used kangaroo camps, a male kangaroo in the process of loosening the soil, and evidence of erosion of the topsoil and subsoil from older camps. Recently loosened soil at a kangaroo camp; a prime candidate for erosion with the next heavy rain. 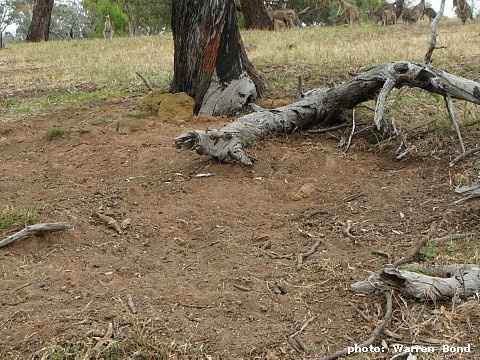 A male kangaroo scratching a "nest" for himself, resulting in an area of loose soil like that above.